Do you ever feel like Matthew McConaughey and Anne Hathaway in Interstellar? You think you’ve just dropped on and off Miller’s planet for a few minutes and realize you were gone 23 years? When you’re drifting through life and not paying attention, time flies so fast. Not only does time fly, but it seems to be picking up speed! That brings up two questions. Why does it seem like time is speeding up? More importantly, can we slow down time? I propose that we can slow down time. Have you ever clicked on what looked like an interesting video link in YouTube? You click the link and the video starts. Since you’re busy and your day is full you check the length of the video. It’s only six minutes. You can spare six minutes, so you click play and change the playback speed to 1.25. Then you click another video. And another. The next thing you know you look up and it’s 2:00 am. What happened to the time? How did six minutes turn into three hours? While looking back through my list of blog post drafts, I noticed one that caught my eye. You have to know how long your legs are. It seems like a few months ago that our Taekwondo instructor said that to us, but the file is older than that. Somehow, two years and five months have passed since he said that. Crazier still is that I wrote those first few sentences of this paragraph eleven months ago. When Master Franks said, “you have to know how long your legs are,” he was talking about spacing when throwing kicks. Based on the length of your leg, we usually need to hop a little toward or away from the target so that the kick’s contact makes the most impact. That takes some self-awareness, knowing how long your legs are and how close you are to the target. Just as it’s important to maintain awareness of where you are, where your target is and how long your legs are when sparring, we need to be aware of what we are doing with our time. We need to be aware of what we’re doing and how much time we spend doing it. Just as we can use our spatial awareness to ensure our kicks have the most impact, we can use awareness of what we’re doing and how much time we’re spending on it to ensure that our time has the most impact. We also need to know how much time we spend on what we’re doing, so it makes the most impact. on my way to seize the day. Also, check out Time is Better Than Money. Is Time Really Speeding Up? Let’s review a few reasons why time flies so fast, or why it seems to pass faster as we get older. One theory is that time is proportional. In James’ theory above, a year of a 10-year-old’s life is 1/10th of that kid’s life. It’s 0.1. A year of a 50-year-old’s life is 1/50th of my life. It’s 0.02. 0.02 is significantly smaller than 0.1, so a year to me passes that much more quickly than a year to my kid. After I spent an hour trying to comprehend that theory, I felt like Jack White in the White Stripes song The Hardest Button to Button. “I had opinions that didn’t matter. That theory blew my mind more than Interstellar. No disrespect to Mr. James, but I also think it’s nonsense. Gobbledygoop. Spell correct is trying to tell me it’s gobbledygook, but I really think it’s goop. For a visual of how his works go to Maximilian Kiener’s Why Time Flies project and scroll down to see how the perceived passage of times speeds up as we age. Bob Holmes wrote an article for New Scientist about a study in which individuals of varying ages estimate the passage of three minutes. According to the study, elderly and young people do perceive time differently. The psychologist conducting the experiment hypothesized that the perception differences could be the result of deterioration in the parts of the brain that manage our internal clock, the basal ganglia and the substantia nigra. 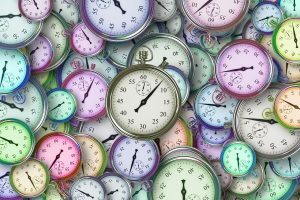 As those parts of our brains slow down in their production of dopamine, time seems to speed up by comparison. Don’t go nodding off or clicking the back button cos I’m using all these fancy scientifical words. I’m about to throw down some mind-blowing hypothicantations of my own! By the way, hypothesis + incantations = hypothicantations. Word! Read on. Time flies when you’re having fun! Can Exercise to Speed up Your Brain and Slow Down Time? If this theory is correct, then maybe we can slow down time’s perceived speed by speeding up our basal ganglia and substantia nigra. This Psychology Today post by Ronald E. Riggo Ph.D., he suggests that repetition may make time seem to pass faster. Likewise “novel experiences,” trying new things, may seem to slow down our perception of time. – Ronald E. Riggio, Ph.D.
Keep your habits and routine, but spice them up. 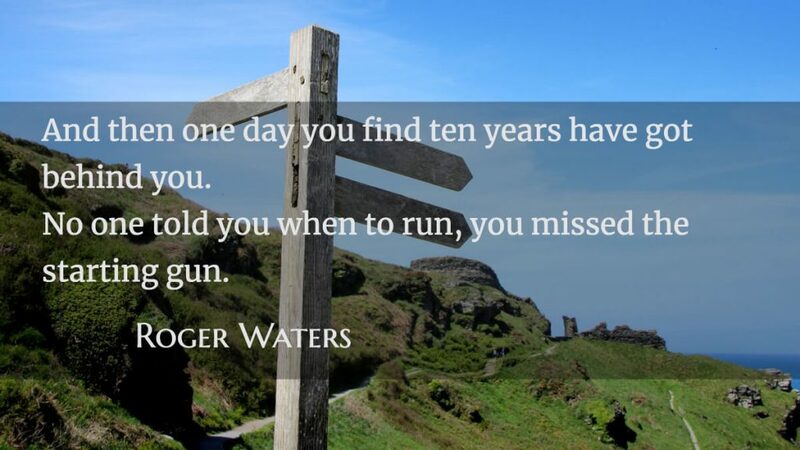 If you run, run in different places. Increase and decrease your pace or distances. If you lift weights, mix up your exercises. Take a different route occasionally for your commute. If you write every day, try some new topics. If you write non-fiction try some fiction. I was shocked by how much time had passed since my Taekwondo instructor said that, but that’s Time. It goes fast. It goes so fast, and then it is gone. If there is something you are thinking about doing, do it now. If there is someone you are thinking about seeing, see them now. Sign up for those guitar lessons. Make sure time flies for you, not against you. These aren’t just activities to pass the time. These are experiences to live. They’re things to relish later or stuff people will pay you to teach them later, stuff to pass on to your kids. Don’t pass the time. Live it. All those things we postpone and procrastinate are things we put in a trunk we can rummage through later. That trunk is called Regret. No matter how you tried to hide regret in a closet or under pretty blankets, it will always be really hard to not see. We can wait, or we can act. We can take pictures and buy souvenirs of what we do and put them in a photo album called Life. You Might have got a little dramatic on that last bit. Don’t look back here on October 3, 2020, and realize all that you have not done in 2 years and 6 months. The feeling of not having time left to do the things we want to do are what makes it seem like time flies so fast. Speaking of starting. If you haven’t started filing your taxes….now would be a good time. When you haven’t finished your taxes, time flies in April. Then, start what you’re meant to do. I can wait until the tide comes around. Can You Slow Down Time? Variety – Mix it up a bit! This Journal of Neurology & Neuromedicine article states that exercise boosts the basal ganglia in addition to most other parts of the brain. We know exercise helps us stay young. Might it also slow down time for us? This manuscript on National Center for Biotechnology Information states how exercise benefits Parkinson’s disease patients because exercise helps boost dopamine (and other stuff) which helps patients with motor disabilities. More dopamine could mean a more stable internal clock, which could result in our perceiving time to pass more slowly. Every article I researched on boosting the basal ganglia and the substantia nigra touched on how exercise helps patients with motor disabilities such as Parkinson’s. It’s exercise every time. No pun intended. Keep up your habits. Habits are what help us grow and improve. Habits get nature’s attention. The compound effect of habits practiced consistently will eventually lead to significant progress. Just mix it up a bit. Add some variety to spice up your life, challenge and exercise your brain and slow time. Making learning a habit will give you the variety you need to make life (and thus, time) less monotonous while also helping you enjoy the compound effect of a consistently practiced habit. Travel to new places. You don’t have to fly to Europe. Drive to a small town in your own stage. Try new restaurants or new cuisines. Go listen to local live music. The more you can live in each moment the happier you will be. That means remaining mindful and present. Mindless repetition of tasks not only leads to a mundane life void presence and happiness but also increase the perceived speed time’s passing. Exercise can help you stay young physically by flushing toxins and boosting brain functions as well as slow down the perceived speed of time. Imagine feeling younger and time slowing down. Not just living a longer life, but enjoying each moment of that long life. Time isn’t really moving faster or slower. It just feels that way. We just perceive it that way. Likewise, while we can’t change the speed of time at which time passes, we can speed up our perception. We can alter our perception of time. Most of the methods of slowing down the perceived speed of time also increase our satisfaction with life. It may not provide the thrills and pleasures we think we want, but it will increase our overall happiness. If we know that time flies when you’re having fun, how will more fun slow down time? When you hate school or hate your job and you want the day to end so you can go home, how are you spending that time? You want the current time to pass to get to a more pleasant time. When you’re having fun and time seems to fly, how are you spending that time? You’re probably not thinking about time. It’s possible that you’re dreading the end of the fun time. You might start dreading the end of the weekend on Sunday afternoon. You might start dreading the end of a week’s vacation on Thursday or Friday. But when you’re completely in the moment and not thinking about the time, does it seem to fly? Why? That is two completely different perceptions. That is comparing the time remaining versus the time that has passed. When we concern ourselves with the rapid passage of time, we’re talking about that time that has already passed. Let’s say you’re wanting a work day to pass quickly so you divert yourself by watching Netflix to pass the time more quickly. You have big plans this evening! If nothing else, leaving that crappy job for the night. You’ll be absorbed in the show and notice less the passage of time until the workday ends. What matters, though, is the perception after the time, the perception of the time you have left to do what you need/want to do. Will you look back at your day with a full day of unfinished work and wonder where the time went? When you have the growing pile of unfinished work you’ll feel the full enormity of what little time you have left to finish the projects. You could also try these simple ways to seize the day in a job you hate. If you work on a task or project to pass that same time, it won’t be as pleasant as Netflix. The same amount of time will pass, though. Then, since you have less work unfinished, you’ll feel like you have more time to finish what you want to do. It’s not about fun. It’s finishing what you want or need to finish. If you exercised, mix in some variety and live in the moment to speed up your brain and slow down the apparent speed of time along with completing the things you want to complete to make yourself feel like you have more time left, time will feel like it slows down. What are some things that you want to do but don’t feel like you have enough time?